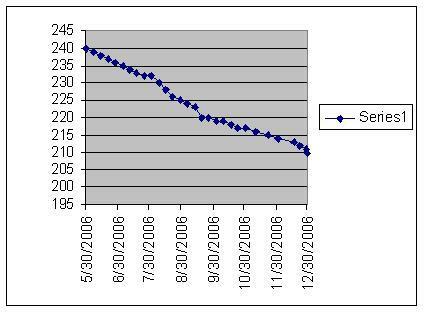 This chart shows my weight loss progression since I started making "by the pound" entries. I lost 30 pounds over 7 months, or roughly 1 pound per week on the average. My net weight loss is 35 pounds from my peak. The depressing side... my new scale shows about 5 pounds more than my old one. My friend and diet buddy Nicole pointed out that I still lost the same amount of weight, but I still can't help but feel a little disappointed that I wasn't as close to 200 as I thought. So I'll starting posting in the new year calibrated for the new scale, which would put me at 215.